UIC student Alexandros Mpougas photographs the processions around the Basilica de Nuestra Senora de Guadelupe. 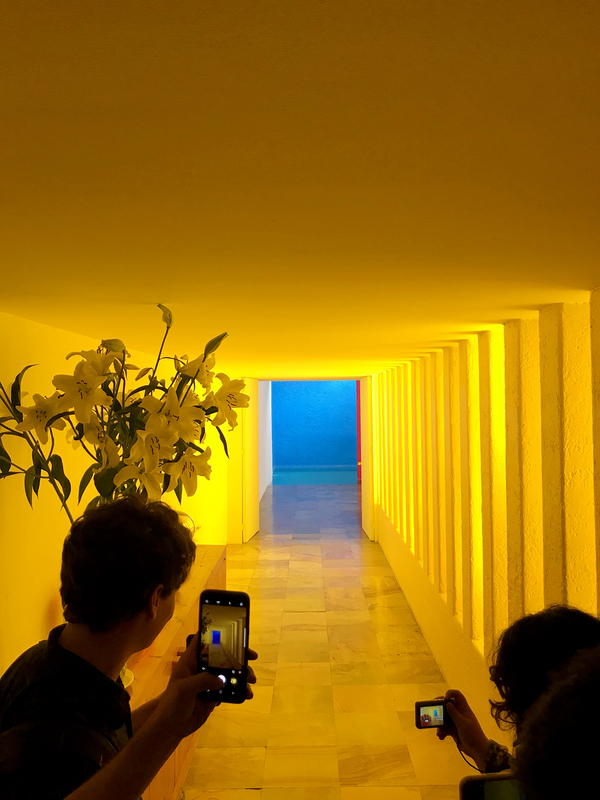 Many architecture majors have studied Mexico City in their college curriculum, but nine UIC undergraduates can now say they have actually seen the giant metropolis up close — and for free. The students, who are all seniors, embarked on a one-week trip in February to the country’s capital for a studio design class called Learning from Mexico City. The class examines the relationships and modality between architecture and the city, known as architectural urbanism. 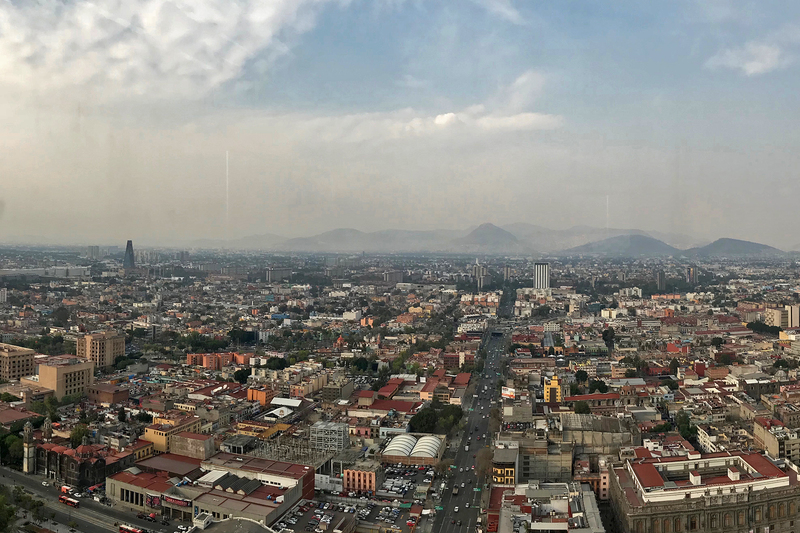 “Mexico City provides a really good case study of urban architecture really unlike any other capital of the world,” said Alexander Eisenschmidt, associate professor of architecture. The city was originally built on an island in Lake Texcoco by the Aztecs, but it was destroyed and redesigned by the Spanish after conquest. “Half of the architecture that is built there is built without regulation, without permit, yet filled with spatial, programmatic and material ingenuity,” said Eisenschmidt. Rapid economic, urban, demographic, technology-based, political and other changes have shaped the city. Now, more than 21.2 million people occupy its metropolitan area, making it the most populous in the Western Hemisphere. In a seminar that inspired the course, Eisenschmidt and students looked at architectural and urban typologies within the city. 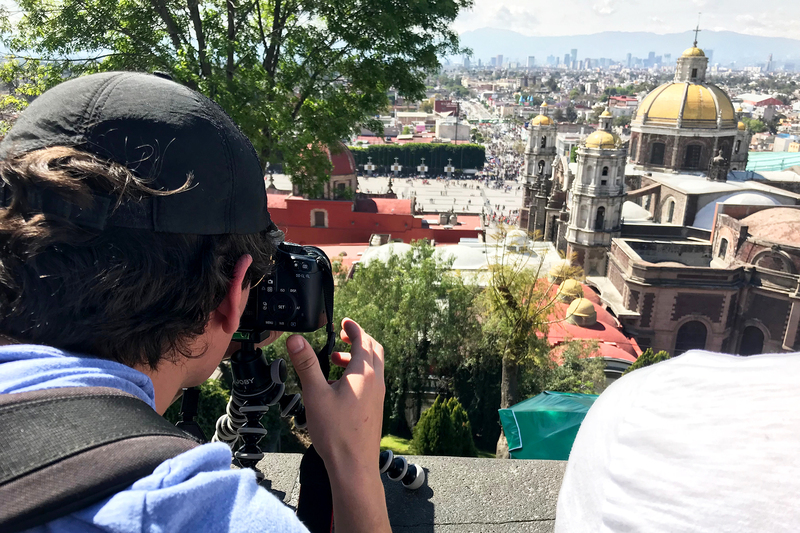 For the design class, students chose a topic for field research in Mexico. The group visited places of architectural significance, too, including a house designed by Pritzker Prize-winner Louis Barragán. During their stay, they met with famous architecture offices, gave presentations at the City Laboratory of Mexico City and collaborated with Mexico’s National Autonomous University (UNAM). The UIC Office of Vice Chancellor for Research (OVCR) funded the trip. “It was an incredible experience,” said Andrew Lang. His research focused on the power that plazas have to control what the city looks like. With the group, he went to the area’s main squares: Zócalo, Plaza de Santo Domingo and Plaza de Santa Veracruz. There, he took an interest in the plazas’ columns and building facades. “Researching in the city, actually going there and experiencing it for ourselves, was completely different from Google Earth and reading papers written about our subjects,” Lang said. The experience continues to help the students. They’re using their newfound knowledge for design projects, which they’ll present at the end of the semester. 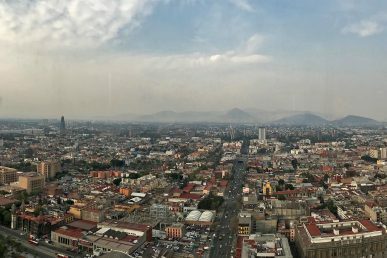 Viewing north from the top floor at the Torre Latinoamericana. Katrina Reyes, whose project focused on the use of fountains, learned more about the architectural repercussions of the megatropolis and larger urban trends. Things like pollution, climate change and natural disasters, such as earthquakes, have made the amount of drinkable water in Mexico City scarce. “I’m designing an aqueduct that will serve as a monumental object, to remind people in the city of what the water used to be,” Reyes said. Her aqueduct is meant to deliver water from a lake to Xochimilco and Tlalpan, where the only source of safe drinking water for some is truck deliveries. “[The trip] was really eye-opening,” said Reyes. Eisenschmidt thanked OVCR for making the travel possible and added that the class will impact students for years to come. “I cannot stress enough how important it was and how much it contributes to the students’ understanding of the world of architecture and diversity of cultures,” he said. 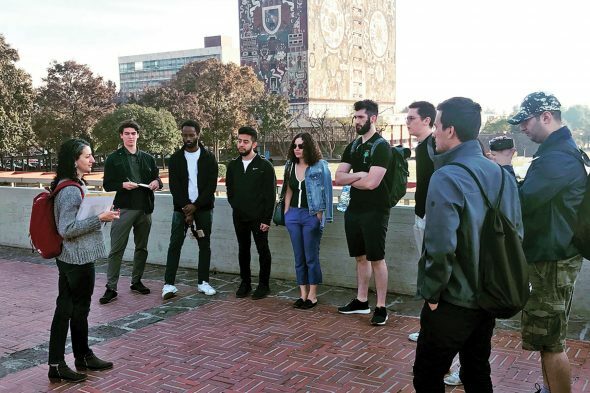 Students Alexandros Mpougas, Amen Tefarie, Blake Hernandez, Victoria Carvalho Cavalcante, Jasen Domanico, Andrew Lang, Adan Orozco, Katrina Reyes and Karam Odisho tour the campus of the Universidad Nacional Autónoma de México (UNAM) with UNAM professor Elena Tudela (far left).